Whether your goal is fat loss, sport-specific training, or to generally increase your physical activity level, our custom training packages will be your cornerstone. We offer in-home personal training with the Vancouver area. We make training within the comfort of your own home or apartment effective, fun, and results-oriented. Whether you are looking for a tailored nutrition plan or simply some guidance on how to implement healthier choices, we can help you out. Join us on one of our Adventure Club excursions, and bring your family and friends along to enjoy the adventure and exercise with you! Bodies And Beyond Is Here For You. As January draws to an end, those of you who decided to make a health related New Year's resolution may be starting to see the results of your hard work. We, at Bodies and Beyond Personal Training want to congratulate you on sticking to your new regime so far! We are also here to give you a few tips on how to stick to the New Year's resolution, and hopefully continue the healthy, happy lifestyle! It's been 1 month since the new year…. you've probably made fitness goals and we hope you have all attained them. But if you are feeling you can't stick up with your New Years resolution we have a suggestion for you. Set new goals! It's important to always set new goals, it doesn't have to be drastic. It can be as simple as drinking an extra glass of water a day. You will be amazed as to how big of a difference setting new goals can make in both your physical health and mental health. It gives your life purpose! Realistically, it might not be possible for you to drop another 50lbs in the next 2 weeks. (If that is your goal) You have to be honest and realistic with yourself. Set SMART goals (specific, measurable, attainable, realistic and time-sensitive). Have troubles with your habits? Replace habits, don't try to eliminate them. Habits need to be replaced with new behaviours. Imagine if you drink 1 can of coke a day for the past few years. It will be pretty hard to stop. You know it's not healthy for you. Instead of completely eliminating coke out of your diet, you can start with drinking 5 cans a week instead of 7, then drop it down from there. You can even go to alternative options such as carbonated/soda water eventually. Everything is about progression and it's a slow process! So try and replace your habits with something similar but not to the extreme of cutting it off completely! Not everyone sticks with their New Years resolution and that's normal for most. We want you to live a healthy and active lifestyle for your benefit. We want what's best for you. But if you are sick and tired of being in the weight room everyday, there are so many alternatives to reach the benefits of exercising. You can try hiking, swimming, biking, running, or even in-home personal training. (Our favourite) It doesn't have to be just one thing or in a gym! We all know that the festive period frequently means missed workouts and copious amounts of food indulged....What's wrong with this I hear you ask? Well, do you really want to throw away the hours you have spent working out over the last few months in 2 weeks of madness? - Have your favourite ____ (chocolate/pie/indulgent foods), savour them while you eat them, enjoy them and then move on - do not guilt yourself afterwards! 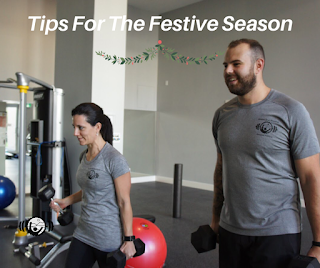 You'll notice that the emphasis is not on avoiding or including specific foods, but is instead about promoting enjoyment of your meals throughout the holidays (and all days!) with friends and family whenever possible. - Make a plan prior to the holidays! Set a realistic plan (for example, weight training 3x a week + 1 conditioning) and follow through with it! - Don't be too hard on yourself! It's the holiday season, enjoy your time with your family! It is okay to miss a few workouts. It won't slow down your progress. It is easy to guilt yourself but just know that rest is important as well! What is hybrid/online personal training?! Our team at Bodies and Beyond Personal Training is very excited to launch 2 new personal training packages for you! They are programs tailored to you and your schedule. Does this interest you? Please read below. What is hybrid training? And why? It's a combination of both in person and online personal training. Not only does it save YOU time, it gives you the flexibility of training on your own with expert supervision 24/7. It is more affordable than our in person programs! Instead of seeing one of our trainers frequently, you'll only be seeing our trainers occasionally while still getting your programming expertise, coaching and accountability. If you already have training experiences but need an extra hand with programming/ training routine then the hybrid program may be suitable for you. This will be more hands on than our online program as you will be meeting one of our trainers on occasion. The program will also be catered towards the equipment you have at home. What is online training? And why? As stated, online training is all done online! With this program you are able to workout on your own schedule and have access to one of our trainers 24/7. It is perfect for those who have a busy schedule. This program is more affordable than any of our programs because it doesn't involve any in person sessions. It is also great for those who want a new routine to bring about the best result. Clients will follow their online training guide through a downloadable app. Concerned about not knowing the correct technique for an exercise? Don't worry, each exercise has a detailed video of how to perform the exercise correctly. Feel unaccountable? Don't worry. With our online program, our trainers are just 1 message away from assisting you. Does this look like something you would be interested in?! Please contact Huw@bodiesandbeyondpt.com for more information or visit our website for more information. Do you suffer from an achy neck or back? Do you spend hours every day sitting at your desk? 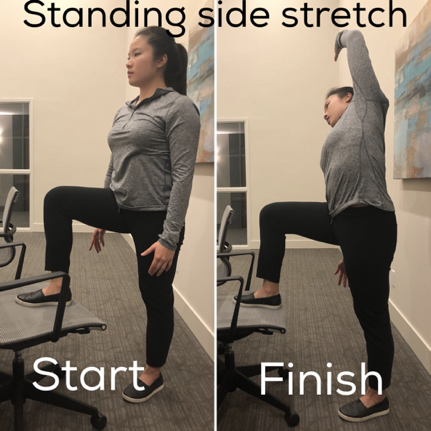 Read on below for some easy tips and ideas to introduce more movement during your day! By: Cynthia Lau, Registered Physiotherapist. 1. 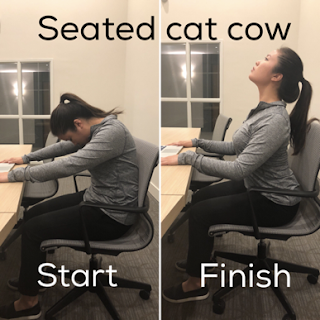 Seated cat cow — With your hands resting on the desk, slowly arch your mid-back toward the ceiling like a cat. Then slowly move into the reverse direction by looking forward and thinking about spreading your collarbones. Repeat for 15 repetitions. 2. 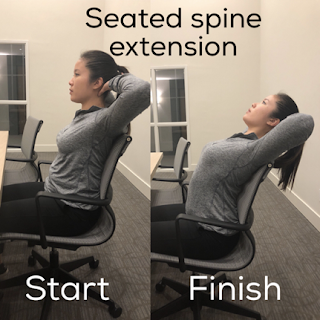 Seated thoracic spine extension over chair — Place both feet flat on the floor and interlock your fingers to support the back of your neck. Keeping your elbows wide, slowly lean back over the edge of your desk chair to open the chest area. Repeat for 15 repetitions. 3. Standing side stretch — With one foot (right) supported on your chair or a stool and the other foot (left) on the floor, gently lean forward until you feel a slight stretch in the front of your left hip. Then reach with your left arm overhead until you feel a stretch along your left side and hold that position for 20 seconds. Repeat on the opposite side. 4. Standing quad stretch with reach — While standing facing a wall, hold one ankle (right) so that you feel a stretch in the front of your right thigh. You can place your opposite hand (left) on the wall to help maintain your balance. Slowly reach your left hand up the wall as high as you can then return to the start position. Perform 12 repetitions on each side. 5. 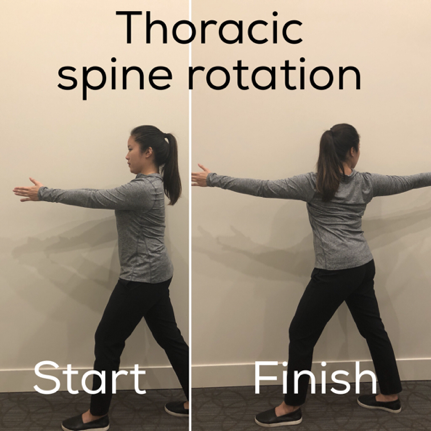 Thoracic spine rotation at wall — Stand with one of your shoulders (right) perpendicular to a wall. Take a big step forward with the foot further away from the wall (left). Raise both arms to shoulder level, ensuring you keep your shoulders away from your ears. Slowly raise the arm closest to the wall (right) overhead then behind you making a semicircle, feeling for a gentle stretch in your shoulders and mid-back. Return to the start position and perform 15 repetitions on each side. 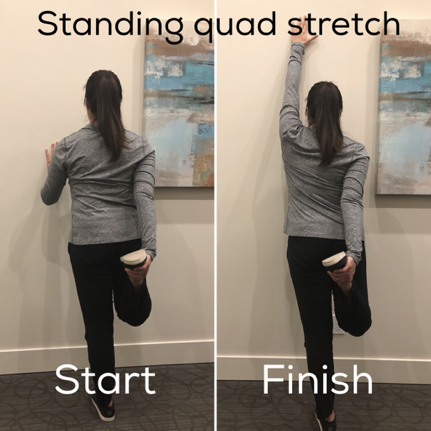 Tip: the closer you stand to the wall, the more challenging the movement will be! Try doing 1 or 2 rounds for every 2-3 hours of sitting. Setting an alert on your computer can help remind you to get up and get moving! Give these exercises a try on your own and let us know how it goes! For more exercise ideas like these speak to your certified personal trainer or physiotherapist. At Bodies & Beyond we want to be available when you need us. Get started by CLICKING HERE to have a personal trainer contact you. Brand DesignThe Red Rabbit Studio.